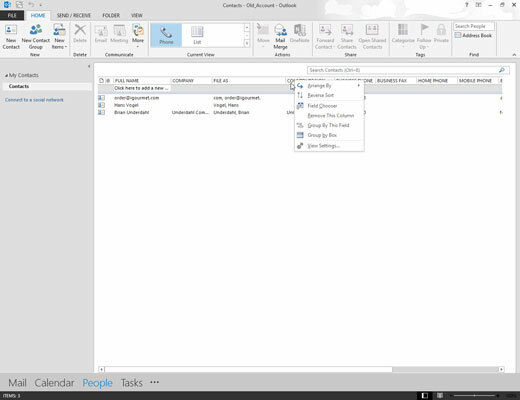 Right-click any column title in the gray header row of the column. Select Field Chooser from the shortcut menu. 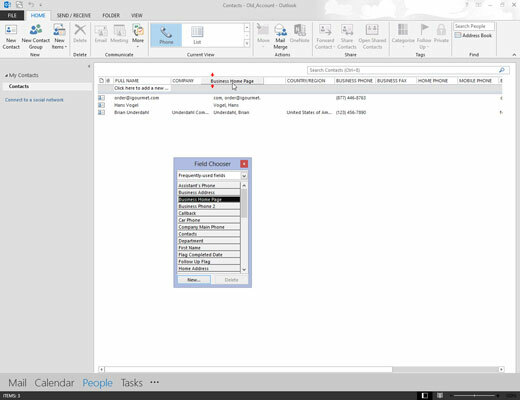 The Field Chooser dialog box appears. Select the type of field that you want to add. The words Frequently-Used Fields appear in the text box at the top of the Field Chooser. Those words mean that the types of fields most people like to add are already listed. 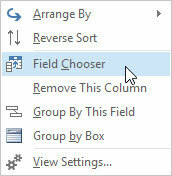 If the name of the field you want isn’t in one of the gray boxes at the bottom of the Field Chooser dialog box, you can pull down the menu that Frequently-Used Fields is part of and see what’s available. Drag the field into the table. Be sure to drag the new item to the table’s top row, where the heading names are. 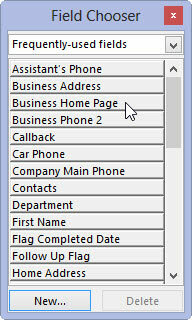 Notice that the names in the Field Chooser are in the same kind of gray box as the headers of each column. Two red arrows show you where your new field will end up when you drop it off.